The Government of Ontario has made changes to the Technical Standards and Safety Act, 2000, to allow for the creation of alternate rules for the Operating Engineers Regulation. The rules will be created by the Technical Standards and Safety Authority (TSSA) and approved by Minister of Government and Consumer Services. The changes are intended to implement recommendations made by a panel of industry stakeholders to adopt a risk-based framework for the Operating Engineers Regulation. Under this approach, businesses would have the option to either comply with the alternate rules or continue adhering to requirements in the current regulation. The changes are expected to result in simplify rules and provide flexibility for businesses to achieve compliance, reduce the regulatory burden on businesses and enhance public safety. The alternate rules will come into effect at a date to be communicated by TSSA and the Ministry. TSSA is seeking feedback on the risk-based framework proposed for the Operating Engineers (OE) regulation. Interested parties can review the proposal summary and detailed reports at and provide their comments by completing the Feedback Form at https://engagetssa.org/. The comment period is open until May 5, 2019. Comments may also be submitted via email to consultations@tssa.org or by mail to TSSA's head office at 345 Carlingview Drive, Toronto, ON M9W 6N9. Molson Coors powerhouse staff raised funds for Movember Men’s Health in memory of recently deceased member Tom Lavin. At the request of Tom's family, his tools and boxes were raffled off and $1280.00 was raised in ticket sales. Tom was a valued employee and had worked in the powerhouse at Molson Coors since 1994 when he suddenly passed away in August 2018. 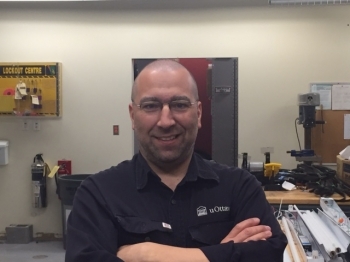 The Technical Standards and Safety Authority (TSSA) has successfully prosecuted the chief operating engineer of a brewery in Hamilton, Ontario, Mr. Mike Murphy. The Ontario Court of Justice in Hamilton levied a fine of $4,500, plus the mandatory 25% victim surcharge, for Mr. Murphy’s violation of a safety regulation under the Technical Standards and Safety Act, 2000 (the Act). Following an investigation by TSSA, it was determined that Mr. Murphy left unattended for approximately eight hours the Arts and Science Brewery plant at 207 Burlington Street East in Hamilton. During that time, while the plant and its units were in operation, there was no qualified operating engineer or chief operator on duty. “Had a mechanical issue occurred, such as a boiler interruption, a steam leak or a boiler failure, there would not have been a competent, certified person on duty to take any necessary action to mitigate the inherent hazards, such as an explosion or a fire”, said Mike Adams, Director of TSSA’s Boilers and Pressure Vessels and Operating Engineers Safety Program. Murphy pled guilty to this contravention of the Act. In Ontario, operating engineers must possess valid TSSA certification and follow Ontario’s safety rules and regulations. If in doubt of an operator’s certification and/or duties, contact TSSA toll-free at 1-877-682-8772. Members of the public can also visit www.tssa.org and click Operating Engineers - Open Data to confirm an operator’s certification. The Technical Standards and Safety Authority (TSSA) is one of Ontario’s public safety regulators mandated by the Government of Ontario to enforce provincial safety regulations and enhance public safety. Throughout Ontario, TSSA regulates the safety of amusement devices, boilers and pressure vessels, elevating devices, fuels, operating engineers, ski lifts, and upholstered and stuffed articles. Its range of safety services include public education and consumer information, certification, licensing and registration, engineering design review, inspections, investigations, safety management consultation, and enforcement and prosecution activities. The organization’s vision is to be a valued advocate and recognized authority in public safety. Catch up on all of the latest news and events! While the economy continues to grow, a changed economic landscape in the United States with new policy measures that the governing Liberals are undertaking today, the Government is pushing Canada further into the red. In the 2019-20 fiscal year, the federal deficit is projected to increase by nearly $2 billion to $19.6 billion, up from the $17.8 billion projected for that year prior to today’s fall economic update. In an attempt to mitigate the impacts of the U.S. corporate tax cuts that are making American businesses more competitive, Finance Minister Bill Morneau has unveiled three new targeted incentives to Canadian companies that are meant to boost business confidence and spur competitiveness in the short-term: allow manufacturers and producers of goods to immediately write-off the cost of machinery and equipment; forgive the cost of any clean energy equipment; and permit businesses of all sizes and sectors to write off a larger share of cost of new assets. The debt-to-GDP ratio is shrinking, but not as quickly as once thought. It's currently projected at 30.9 per cent. The economy is expected to grow by 2.0 per cent in 2018, will stay the same in 2019, and drop below two per cent in 2020, to 1.6 per cent, a year later than the 2018 budget predicted. After the 2019-20 fiscal year, the deficit is projected to drop over the next four years, down to $11.4 billion in 2023-24, with still no budget balance in sight. 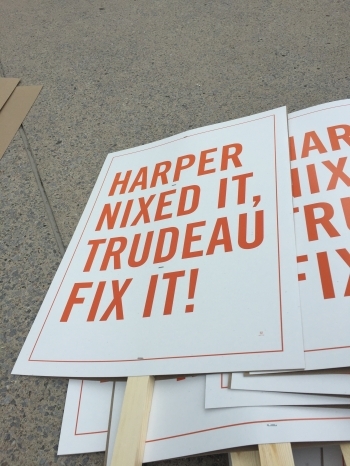 During the 2015 federal election campaign, Prime Minister Justin Trudeau had pledged to run maximum deficits of $10 billion until 2019, when he promised to balance the books. In short, despite the continuing deficits, the Government claims Canada's economy is strong and growing, wages are growing, there's more good, well-paying jobs for Canadians, consumer confidence is strong, and business profits are up. - Increase investment in the clean technology sector by allowing specified clean energy equipment to be eligible for an immediate write-off of the full cost. This will help achieve climate goals, and position Canada to be more globally competitive. - Remove barriers to trade within Canada by working with provinces and territories to enable businesses to transport goods more easily, to harmonize food regulations and inspections, to align regulations in the construction sector (including the harmonization of building codes across Canada), and to facilitate greater trade in alcohol between provinces and territories. - Starting in 2019, in collaboration with our provincial partners, the Government is enhancing the Canada Pension Plan (CPP). The CPP enhancement will be phased in gradually, starting in January 2019, and will raise the maximum CPP retirement benefit by up to 50 per cent over time. This translates into an increase in the current maximum retirement benefit of nearly $7,300, from $13,855 to more than $21,100 in today’s dollar terms. - The Government will introduce legislation to implement the prompt payment of contractors and sub-contractors for federal projects on federal lands as well as the adjudication of payment issues. Collective Bargaining Ontario provides users with a self-serve digital and interactive interface in accessing collective bargaining information and is designed to give you maximum flexibility, timely access to the most up-to-date data, with 24/7 availability through your computer, laptop, or mobile device. The website will continually evolve with the rollout of a new electronic mechanism for submitting DRS requests and expanded interactive reporting scheduled for release in 2019. Please visit the Collective Bargaining Ontario hub at www.lrs.labour.gov.on.ca/. To join the mailing list and receive information on upcoming features and services available on Collective Bargaining Ontario, please send an email to cbis@ontario.ca with the subject heading: “Collective Bargaining Ontario Mailing List”. The Ontario Ministry of Labour has released it's quarterly report on bargaining in the province for the second quarter of 2018 which includes details on settlements reached as well as statistics and trends. Read the report here. 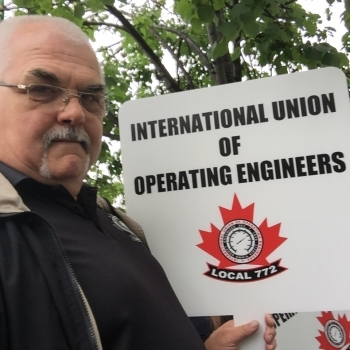 The latest General Membership Meeting took place Saturday September 22, 2018 at 5:30 PM at the Holiday Inn Burlington located at 3063 South Service Road, Burlington, ON L7N 3E9. These meetings are an important forum for our membership to discuss critical issues and are an opportunity to learn about the Local’s initiatives and business strategy for the next six months. Local 772 provides an all-encompassing training session for Shop Stewards that includes the grievance process, arbitrations and human rights with guest speakers. The last session took place Saturday September 22, 2018. Any Stewards interested in attending an upcoming session that have not attended a previous session are asked to contact us at 905-527-5250 (Hamilton) or 613-748-0546 (Ottawa). The Hamilton and District Labour Council is the voice of working people in Hamilton. By pursuing jobs, peace and security, they seek to build a community that values human dignity and basic fairness. The Labour Council is an assembly of delegates elected by local union affiliates of the Canadian Labour Congress (CLC). An executive council, elected by the delegates for a two-year term, helps the labour council to shape its agenda and then implement its decisions. Workgroups assist the executive by reviewing issues, hearing delegations, proposing actions and organizing events, e.g. the annual Labour Day Parade. The Labour Council is an umbrella group that brings together local unions so that collectively they can better represent our members, defend free collective bargaining, assist the unorganized and generally improve the quality of life in our city. 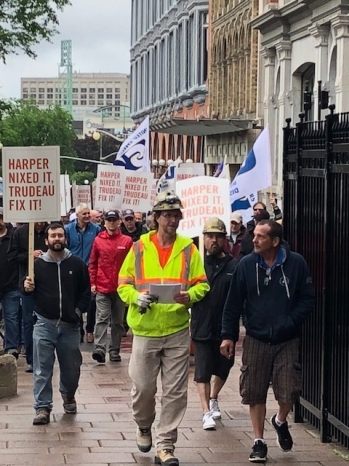 They actively promote the concerns of our members about social, economic, environmental and workplace issues to governments, community decision-makers and the general public and actively advocate for health and safety reform, worker training and labour-specific education. To download their latest flyer, click here and to visit their website, go to www.hamiltonlabour.ca. Click here to visit the Union Savings website and see all available discounts. 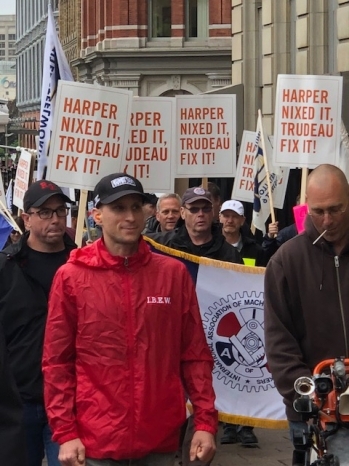 On June 5, 2018, members of IUOE Local 772 joined members of other unions including the United Steel Workers, and representatives from the Canadian Alliance of Nuclear Workers, the Professional Institute of the Public Service of Canada, the Canadian Labour Congress as well as NDP MP Scott Duvall to protest in solidarity against the Canadian Government removing nuclear workers from the public service pension. The government is compromising the pension of 3,400 workers at Canadian Nuclear Laboratories. These are high-skilled workers who signed up with the industry and the risks that come with it because of the good pay, benefits, and pension. 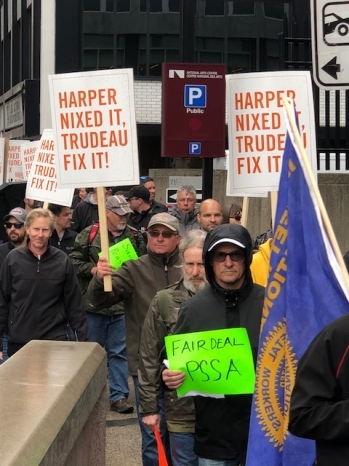 In addition to the basic issue of fairness, the government should consider that with CNL on the verge of decommissioning the Pinawa site in Manitoba, it is the wrong time to drive experienced workers away. After leading on workers for well over a year, the government is revealing they were not negotiating in good faith. We are calling on the government to do right by these workers and stand by their pension promise. 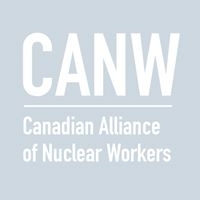 View videos and photos from the event on the Canadian Alliance of Nuclear Workers' Facebook page here and the Alliance's website here and Twitter account here. Hamilton and District Labour Council Scholarship Application - Please call 905-547-2944 or email hdlc@cogeco.net. 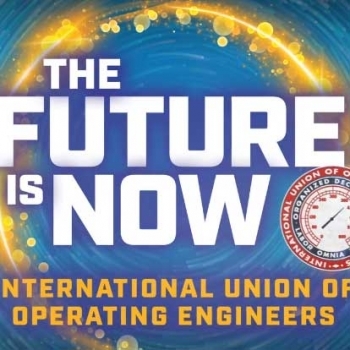 On May 6th, the IUOE welcomed Business Managers and Agents from all IUOE Locals across North America to the 39th Annual General Convention in Hollywood, Florida. To view videos featured at the event click https://vimeopro.com/kellycompanies/iuoe-conv-2018. Of particular interest will be the piece on Stationary Engineer Tiffany Rogers as she recounts how becoming a Stationary Engineer has set her up for success. To view photos of delegates click https://www.eleriever.com/iuoe. The union that represents 400,000 North American equipment operators, mechanics, welders, surveyors and stationary engineers wants to revolutionize how the workforce gets trained on new technology, and is forming creative partnerships with equipment manufacturers as they prepare to open a massive training complex outside of Houston. The International Union of Operating Engineers (IUOE) is launching the training center and entering into partnership agreements with several prominent members of the Association of Equipment Manufacturers (AEM). Brands like Tadano, Manitowoc, Grove, Potain, Link-Belt, Terex AWP and Genie will provide heavy equipment on which workers will receive training at the center. Discussions are also underway with other prominent manufacturers. Scheduled for completion early in 2018 and a grand opening in the spring, the IUOE Training and Conference Center is a first-of-its-kind comprehensive training complex. It features 235 acres of rugged Texas back country as a venue for IUOE members to learn how to operate the latest technology in the heavy equipment, crane, pipeline, surveying and stationary plant domains. While the partnerships and training programs are still being finalized, union chief of staff Joe Giacin says equipment manufacturers who partner on the project can benefit by growing the pool of workers who are qualified to operate their individual brands of heavy equipment. 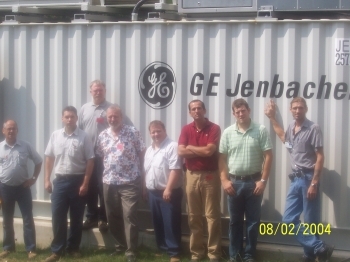 He welcomes inquiries from companies that might be interested in getting involved at jgiacin@iuoe.org. One common thread will run through every piece of curriculum the IUOE offers at the center—the emphasis on training operators, engineers and mechanics to be highly-skilled technicians capable of putting modern heavy equipment’s on-board suite of advanced computer technology to its fullest, most efficient use. But the IUOE and its partners are not only developing curriculum to orient workers on modern GPS guidance, computer control and electronic safety systems, all while keeping crews safe on the job site. They are also tailoring their training so that workers of all experience levels can benefit. Apprentices will be able to learn new skills and gain an entry into trades work. Veteran crew members will be able to hone their skills and learn new technology. And more than 1,000 IUOE training instructors from across North America will receive standardized instruction on how best to offer training at a local level. When the facility opens its doors to the first wave of operator trainees this spring, Callahan says it will represent the completion of the IUOE’s largest investment in worker training in its 122-year history. Located in the Houston suburb of Crosby, the complex will include 227 dorm rooms to provide on-site housing for visiting trainees from across North America, along with cafeteria and conference facilities. The IUOE already operates worker training facilities at many of its more than 120 local unions throughout the United States and Canada. But Giacin says the new IUOE Training and Conference Center will offer something that’s hard to come by anywhere else—immediate access to the most current products and technology available in today’s market. Training programs on the center’s 235-acre range will run anywhere from a few days to many months, depending on the experience level and needs of the trainees in question. With the help of corporate partners, Callahan says the comprehensive equipment operator training ground will be capable of preparing the next generation of workers to meet the needs of the future workforce. For a union that’s long placed an emphasis on training its people, Callahan says the IUOE Training and Conference Center is the next step in the evolution of worker education. 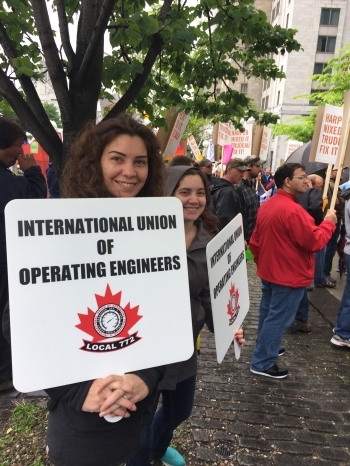 The TSSA, IPE and IUOE Local 772 are continuing to work to address the looming shortage of Operating Engineers in Ontario. One of the fixes that we can all improve upon is acceptance of OE college students for their practical experience towards their qualifying steam time. Please refer to the attached letter here for more information on the issue and how you can help. 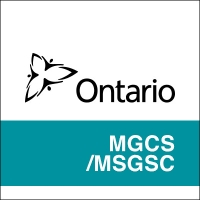 The Ontario Ministry of Government and Consumer Services is seeking your input regarding potential amendments to the Operating Engineers regulation (O. Reg. 219/01) under the Technical Standards and Safety Act, 2000. This is the first public step towards renewing the Act & Regulations for Operating Engineers. The registry allows members of the public to participate in developing regulations by providing comments on regulatory proposals. The ministry will be taking the input it receives into consideration when bringing forward the final regulation for approval. The comment period will close on September 26. What are the Potential Changes? The Ministry of Government and Consumer Services (MGCS), in collaboration with the Technical Standards and Safety Authority (TSSA), established a 15-member panel of representative Operating Engineers (OE) stakeholders. The purpose of the industry panel was to make recommendations to government on how to modernize the OE regulation while maintaining high-levels of public safety. The regulation should adopt a risk-based approach to ensure that any regulatory requirements imposed on business are informed by the risk posed by the plant. Path 1 (Category-based requirements) – This approach would provide plants with category-based requirements to fulfil based on the risk rating of a plant type. Risk ratings would be developed for different categories of OE plants. Path 2 (Site-specific requirements) – This approach would provide plants with an opportunity to develop their own site-specific risk and safety management plan (RSMP). For Path 2, the regulation would identify requirements for what would have to be included in the RSMP, but the onus would rest with the plant owner to develop a plan that provides sufficient evidence to prove that the plant would be able to maintain the acceptable risk-level. TSSA and the ministry should consider opening up other avenues to acquire qualifying experience to ensure candidates are able to get the experience required to achieve higher certifications. The TSSA’s Director of Boilers and Pressure Vessels and Operating Engineers Mike Adams delivers discussions about new developments and current issues in the BPV/OE sector. The Ontario Ministry of Government and Consumer Services is seeking your input on proposed amendments to the Boilers and Pressure Vessels (BPV) regulation (O. Reg. 220/01) under the Technical Standards and Safety Act, 2000. Information about the regulatory proposals is now posted on Ontario’s Regulatory Registry for public feedback. The comment period will close on July 17, 2017. The Registry allows members of the public to participate in developing regulations by providing comments on regulatory proposals. The ministry will be taking the feedback it receives into consideration when bringing forward the final regulation for approval. In February 2016, the Ministry of Government and Consumer Services, in collaboration with the Technical Standards and Safety Authority (TSSA), established a 14-member expert panel of BPV industry stakeholders with representation from insurance companies, third-party inspectors, and BPV owners and manufacturers. The purpose of the consultation was for the panel to make recommendations to government that would assist in addressing long-standing challenges associated with the operationalization of the BPV regulation. Upon insurer’s periodic inspection of a boiler or pressure vessel, the owner or operator of the device would be required to apply for authorization from TSSA to operate their device (Certificate of Inspection) with the payment of a fee and a copy of the Record of Inspection. Insurers to submit device inspection information and attest to the accuracy of this information in the form and frequency specified by TSSA. Insurers to file information and to attest to the accuracy of that information. Insurers could be subject to an audit by TSSA to verify information provided by insurers as well as determine compliance with regulatory requirements. Provide flexibility for TSSA to differentiate between high-risk and low-risk piping and fittings based on research and analysis conducted through a standards development organization. Additional draft regulation proposals to improve the effectiveness of TSSA’s BPV Safety Program (please refer to regulatory registry posting for more information). The regulatory oversight of boilers and pressure vessels is addressed through the BPV regulation (O. Reg. 220/01) and the Operating Engineers regulation (O. Reg. 219/01), both of which are made under the Technical Standards and Safety Act, 2000. The Operating Engineers regulation is not the focus of this consultation. The BPV regulation governs device safety including design, manufacturing, installation, operation, maintenance, and decommissioning. TSSA is an arms-length, not-for-profit, self-financed administrative authority that is responsible for administering the act and regulations. The Ministry of Government and Consumer Services is responsible for bringing forward any changes to the act or regulations and for overseeing the performance of TSSA. BPVs are equipment that produce and distribute hot water, steam, compressed air, liquids, and gases, as well as refrigerants. They are used in a wide-variety of industries in Ontario, including power generation, manufacturing, agri-food, forestry, and dry cleaning. They also provide refrigeration and heating services for a variety of buildings and institutions. TSSA enforces the regulation through its BPV Safety Program. BPVs in Ontario have a strong safety record and incidents related to this type of equipment are rare. The ministry appreciates hearing from affected stakeholders while considering regulatory changes. We also ask that you please share this email with any other organization or individual that you believe would be interested in providing feedback on the proposed amendments. Should you have any questions regarding these proposals, please email publicsafetybranch@ontario.ca and a staff member will contact you. It all began in 1993. I wasn’t sure after leaving school in 1991, just what I wanted to do for money or a career. I worked at a variety of seasonal positions which left me ice fishing all winter but knew I needed to start a career in something. A person can only ice fish for so long! So I decided to contact the local college in Ottawa to explore different career options. To my luck, I was directed to the Coordinator for Trades, Tim Breton, who took the time to answer questions, provide guidance and explore the options available. My future was clear. I enrolled in the Power Engineering program. With an aptitude in math, physics and mechanics, my quest for a career was over. As a Power Engineer, l was on my way to a career that provided daily challenges that I enjoy to this day with a superior wage, pension and benefits. During the summer holidays and weekdays, I completed the “on-the-job training” at Queensway-Carleton Hospital and I graduated with honours in June 1996. With a break in my career for personal reasons, then working two jobs and applications for full time employment in August 1998, I was hired on as a Fourth-Class Engineer and I continue to this day my career as a Stationary Engineer at the Hospital. I was set for life. The best of all was that I had already worked at the Hospital through college and had the opportunity to blueprint the entire HVAC system while doing my on the job training as well as become a permanent team member of the guys at the plant. My first year I was the preventative maintenance guy servicing all of the equipment. This was great hands-on experience. The second year entailed working on the Y2K project in anticipating a major catastrophe of computer shutdowns (and now it's funny 15 years later). Next, there were hospital expansions and equipment changes. After the emergency building expansion, the main boiler room retrofit included the installation of a co-generating plant and the operation of a V20 engine, and learning how to get the most of a co-generation system. A new chiller system was added in 2009. From 1994 with a building size of 680,000 square feet, the plant is responsible for over 1,200,000 square feet, doubling in size and a state of the art facility with full computer control for all facilities. With the growth of the hospital, equipment and plant, so has my career, personal and professional growth. A 4th Class Engineer in 1998, Lead Hand in 2006 and now the Building and Systems Chief Operator. I am fortunate in that I can look back from the beginning on my career decision, growth and the satisfaction of making a difference, being part of the Union, enjoying the daily challenges and leading a team. The Queensway-Carleton Hospital Operations department. The TSSA has compiled a list of Ontario providers offering training, examination and certification. Find details here. 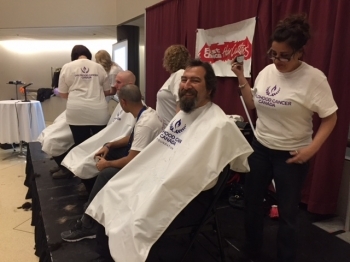 Allan Hager, Maintenance Engineer at the University of Ottawa does his part in raising money for cancer research. 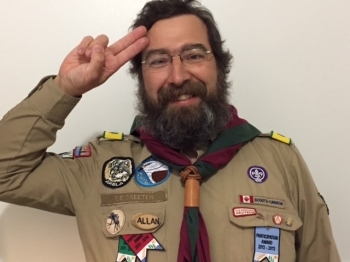 Besides giving all his hair, a pizza lunch with the Engineers also raised money in support of Allan shaving it all off. In total, over $30,000 was raised at the University! A not-for-profit entity called Canadians United for Change (CUC) was formed as a result of a resolution that was passed unanimously at the 57th Canadian Conference of the International Union of Operating Engineers held in 2015 in Halifax, Nova Scotia. The organization ran a political campaign during the 2015 federal election and will also run campaigns during future elections. Click here to visit the Canadians United for Change website or click here for their Facebook page. Education Designed for Workers! This program gives working people the opportunity to understand and change the problems they face as workers. Discussion includes how work is changing, how government policies effect workers, and the role of the labour movement today. 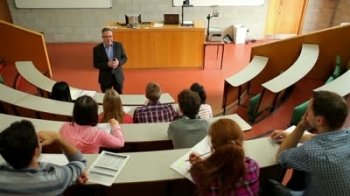 Classes are small and based on a positive and comfortable learning environment. McMaster will schedule around shift work, overtime and family obligations. Most courses are in the evening or on weekends. For more info, visit http://labourstudies.mcmaster.ca/labour-studies-dev/certificate-programs/hdlc-mac-certificate. IUOE supports co-op students and apprentices in training the new generation of Operating Engineers! The TSSA had a real concern – a critical shortage of power engineers which meant shutting down vital components of our society. So a recruitment video was produced that would be shown to high school students across the province to show our young audience what a power engineer really does in an informative, dynamic, and relevant way. View the video here. The International Union of Operating Engineers is proud to announce that we have partnered with Canadian Blood Services and joined Partners for Life - a national program for organizations that are committed to giving blood and saving lives! Since one blood donation can help save three patients in need, just imagine the lifesaving impact that the IUOE will make annually! Call 1-888-2-DONATE (1-888-236-6283) to find a blood donor clinic near you. In 1970, my father, Paul Lamoureux, started his career with Sealtest Dairy in Ottawa as a proud Operating Engineer. In 1971, with only a year in the Company, my Father was elected as the new IUOE Shop Steward which lasted up until 1982. In 1985, he was promoted as Chief Engineer of the Plant. When I was younger, I had the pleasure of visiting my father at work. I was so inspired by all of the machinery and the complexity of the Plant. To my Father’s delight, because I was so intrigued with his work and the Plant, he suggested I go into the same field as he, which I did. I finished school in 1983 with an Engineer Certificate and with a Refrigeration course. From 1985 to 1990 I worked with my Father in the same Dairy Plant in Montreal. The Plant was enormous, producing all kinds of dairy products including milk, yogurt, ice cream and more. When I started out in my on the job training, as a little joke, they gave me an ice cream bar at -20C. Of course at -20C, the bar stuck to my mouth and I had to use hot water to get it unstuck. In 1990 I was transferred to downtown to the Ottawa Sealtest Plant which was located on Cooper Street, at that time. Looking back, I think of how fortunate I was to work with my Father. I learned all the tricks of the trade, as a Mechanical Operator, from pumping down systems, overhauling ammonia compressors and taking everything apart from A to Z. Great hands on experience, that has stayed with me throughout my career. I was truly blessed to have the opportunity to work closely with my Father, bringing us close with a bond between Father and Son…sometimes too close as he would say. My Father was old school, “If you aren’t fast enough to do the job, then I’ll do it”. He was a very hard worker, dedicated and you could count on one hand the days he took off sick while working for the Company. In 1993, the Plant in Ottawa, was transferred to Orleans on Dairy Drive, now called Agropur Division of Natrel. Another chapter in our careers. A new challenge for both of us, my Father and I. The Plant was a state of the art facility. No more mechanical control and manual operation. Everything was computerized and PLC programmed which made it easier to make changes and fine-tune the Plant. In 2004, my Father decided to retire and enjoy his pension after 35 years of service. He loved his work and every summer for a couple of months he comes back to replace us while we are on vacation. Every time I see him he wants to know the news from work and he really likes to hear the current gossip and give his comments. In 2007, I became the alternate Shop Steward, in the good hands of the International Union of Operating Engineer. In 2007, promoted as Chief Engineer, with the help of the Union, I’m still going strong after 25 years service for the same Dairy.